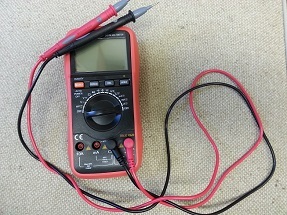 V79 DMM is a True RMS digital multimeter as well as a thermometer. This is an auto raging meter that will give reading when you plug it in at any times. This is a 3 3/4 digits meter that reads 3999, this gives you much higher accuracy than a meter with a reading at 1999 only. The back light on the LCD gives you convenience in a dark, and auto power off saves the battery in a long run. It comes with a pair of test leads and a set of thermocouples, it works on a 9 V battery, a test battery is included. You can use it to measure AC/DC voltage and current, resistance, capacitance, frequency and temperature both in Fahrenheit and Celsius.